During the last week of October, Indiana University joins institutions around the world from countries as diverse as Senegal, Ghana, Austria, Lithuania, Brazil, Argentina, Canada, and dozens of US states to host a great variety of events for International Open Access Week. The groups include institutions as varied as university libraries, academic publishers, governmental groups, scientific organizations and even Wikimedia. As previously covered in this blog and elsewhere, Open Access is vitally-important goal that is supported by Indiana University Bloomington. Indeed, as shown by the recent announcement by Science Europe, IUB and its faculty was ahead of the curve in embracing and supporting an Open Access policy for all faculty members. Open Access means that knowledge is regarded as a public good and shared resource, and authors use open access publishing to make the fruits of their research such as scholarly articles, datasets and source code, accessible to the world for the sake of inquiry and knowledge without expectation of payment. Adopting such a policy reduces barriers to research and learning by making research available on the public internet to be downloaded and shared freely, making it possible for scholarship to be more widely read and cited than literature that appears in closed-access, licensed journal databases. Open Access Week supports all of these goals–through a vast panoply of events and initiatives, OA Week seeks to raise awareness around Open Access and to encourage even more participation. No stranger to participation in OA Week, the Scholarly Communications Department, in collaboration with Indiana University Libraries, IU MoneySmarts, the Teaching and Learning Department and others in the Learning Commons are hosting a series of events for students and the public to learn all about Open Access, why you should care about it, and what you can do! Anyone affiliated with Indiana University–students, staff, and faculty–can create an open access journal at no cost! This session will give an overview of the publishing platform, services, and support IU Libraries provides to those interested in starting a journal. The session will also provide information on flipping a closed journal to open access to those interested. Participants should bring any questions they have about journal publishing, open access, or their specific publication to the session. This semester I had the privilege of teaching “Academic Editing and Publishing,” a one-credit hour course for the Indiana University Journal of Undergraduate Research (IUJUR) student editorial board. I co-taught the course with a current undergraduate student and the former editor-in-chief of IUJUR, Sonali Mali. The purpose of the course was twofold: to give students a practical skillset for publishing a multidisciplinary undergraduate scholarly journal at Indiana University while also informing students of larger conceptual academic publishing issues. Striking a balance between practical fundamentals—for example, learning the ins and outs of our publishing platform and evaluating submissions using IUJUR-specific rubrics—with larger concepts was sometimes challenging. Overall, I think that students appreciated the authentic learning experiences that resulted from using an active journal as a tangible example throughout the course. 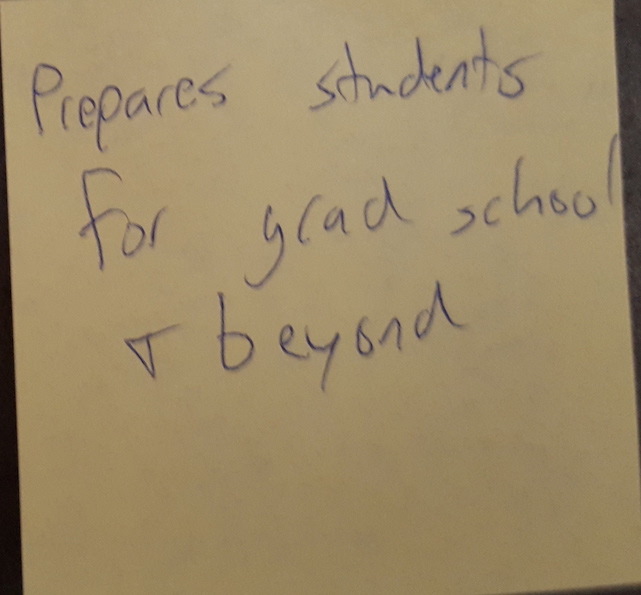 I learned a lot about myself as an instructor and the importance of librarian perspectives in undergraduate publishing education. Library publishers are experts in ethical publishing practices, open access funding, and various peer review models. 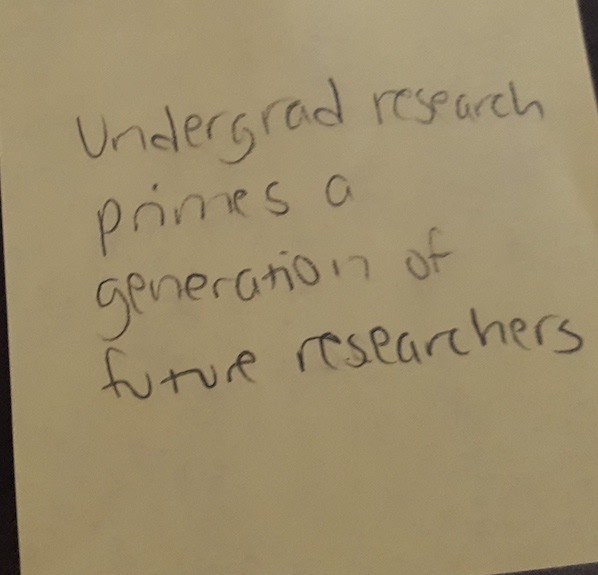 Students were most passionate when we discussed the cost of information, open access publishing, and new publishing innovations, including post-publication peer review, data publishing, and including 3D and media in traditional journal publishing. I was excited to talk about these developments in the context of the work that IU Libraries is pursuing and several of the case studies we discussed in class were pulled from work that the Office of Scholarly Publishing (OSP) and IU Press is currently engaged in. Kuh’s list applies to the intensive work that IUJUR authors and editors do to publish a multidisciplinary journal regularly. 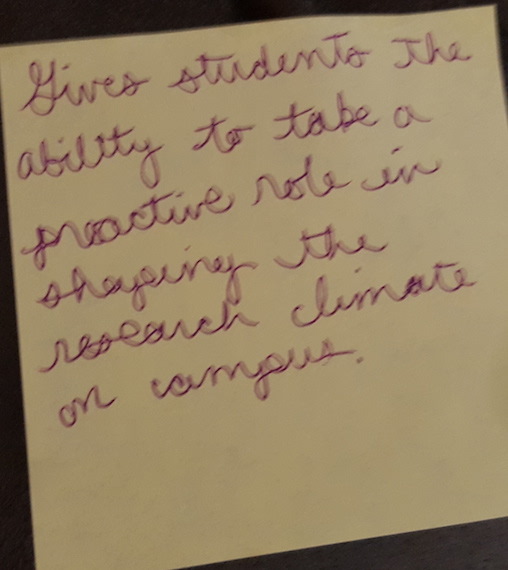 Throughout the course I always tried to come back to our first session and the reasons that students identified for why undergraduate research is important. I can now articulate that the product–the final research output that others can read and cite–is only a piece of the puzzle. The process that IUJUR student editors and authors go through is just as fundamental. The process is where learning takes place. It’s where we train future researchers, scholars, and citizens to think critically about access to research and how we evaluate scholarship. It’s where we build relationships with students that transform their future career paths and broaden and enhance their existing interests. I am thankful to play a small part in the IUJUR student editors’ process and be part of a campus that prioritizes undergraduate research.